Beekeepers Sign "HONEY FOR SALE". 380mm x 300mm, 12mm thick untreated solid timber plaque, engraved as shown. 50mm high, 3mm thick untreated ply letters, x11 - HONEY FOR SALE. The letters are all uppercase, font style as shown - friendly and informal style - bold and easy to read. 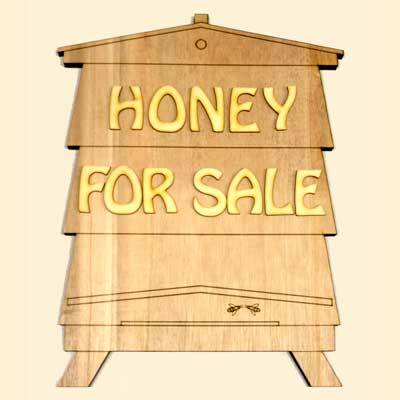 This HONEY FOR SALE sign is only an example of what can be created with DIY signs - different sized plaques and font styles are available separately so you can design your own DIY sign. These wooden signs are designed to let you finish and assemble them in your own style - supplied untreated and with the plaque and letters as separate components - decorate it yourself DIY. The untreated timbers look attractive as they are but the large range of wood oils, waxes, stains and paints generally available mean the possibilities for creativity are endless. For example, queen marking pens are a perfect way of adding colour to the letters and our beehive decorations can also be added to make your creation unique. A great way of involving all the family in a wet weekend activity project. A natural looking alternative to plastic acrylic signs.